Venerable Viradhammo was born in Esslingen, Germany in 1947 to Latvian refugee parents. They moved to Toronto when he was four years old. He studied engineering at the University of Toronto but became disillusioned with academic life and left in 1969 to see the world and experience other cultures. Later, while living in India, he encountered Buddhism, meeting the late Samanera Bodhesako, who introduced him to the teachings of the Buddha. He eventually travelled to Thailand to become a novice at Wat Mahathat in 1973 and took bhikkhu ordination the following year at Wat Pah Pong with Ven. 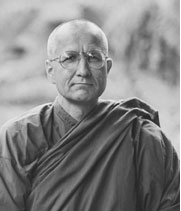 Ajahn Chah. He was one of the first residents at Wat Pah Nanachat, the international monastery in north-east Thailand. Having spent four years in Thailand, he went back to Canada to visit his family in 1977. Instead of returning to Thailand, he was asked by Ajahn Chah to join Ajahn Sumedho at the Hampstead Vihara in London. Later, he was involved in the establishment of both the Chithurst and Harnham monasteries in the UK. “In 1985, invited by the Wellington Theravada Buddhist Association, he moved to New Zealand, accompanied by Venerable Thanavaro, where he lived for 10 years, setting up Bodhinyanarama monastery. In 1995 he came to the UK to assist Ajahn Sumedho at Amaravati and stayed for four years before returning to New Zealand, where he lived until 2002. From that time until 2011 he lived in Ottawa caring for his mother. In 2006 he founded Tisarana Buddhist Monastery in Perth, Ontario, where he is currently the abbot.